It is commonly used in business development and marketing, but it is a great tool to apply to long-term investing strategies as well. When making any investment decisions about a company, you should carefully analyze these points. As such, here are different aspects to consider when making an investment in an individual company. Understanding the strengths of the company you are investing in is a big deal. For many companies, leveraging their strengths is what has made them successful over the years. For example, for many companies, it is rare there isn’t a competitor in their space. Google is a prime example. It has been so successful because it has strength in developing a superior search product. Others try to compete, but are not as successful. The same is true for many companies. Every company and every market will have different strengths. For example, many tech and pharmaceutical companies rely on patent protection for their products. However, these patents are granted because of people or research, or maybe good acquisitions. It is important to know the reasons why and analyze the strengths. This is just as important as knowing the strengths of the company — the weaknesses will tell you the potential downfalls. Many times, it can be hard to figure out a company’s weaknesses, because most companies work very hard to only show their strengths. A good place to look for company weaknesses is in the annual report, especially the notes to the financial statements. It is in the section that the company discloses their potential liabilities, as well as where they see potential competition. With this information, you can gauge the company’s weaknesses and make a more informed investment decision. Once again, depending on the market, every company’s potential weakness will be different. For example, utilities don’t have to worry about competition because they have a monopoly over their service area. However, regulation of utilities can impact financial strength, and can also create high liabilities in areas such as environment or safety. This can be a hard one for individual investors to figure out. It basically means opportunities this company has to grow further, or otherwise increase profitability for shareholders. Some companies can benefit from macroeconomic trends that are easy to spot. However, for other companies they can be difficult to spot. For example, it may have been hard to understand the opportunity Apple was pursuing with its first iPod, since it was such a revolutionary product. This is where reading through an entire annual report for a company can be so useful. Usually, in the first section (which is in color and printed on high-quality paper), companies will discuss what opportunities they are going after. This can be a good indicator of what to expect, and you can analyze it and decide on an investment based on your thoughts. Finally, every investor needs to look at direct threats to their investments. This is more than just the weaknesses of the company — these are direct-impact items that everyone needs to pay attention to. For example, a weakness of a toy company could be that it has high liability potential around selling toys to kids. However, the direct threat to the company can be pending litigation around toy safety. Every company has threats, and these external factors need to be carefully considered by potential investors. Once again, the notes to the financial statements can provide great insights into potential threats to the company. Some good examples are: a class action lawsuit against tobacco companies, bans on drilling for oil and gas companies, or the creation of generic drugs for pharmaceutical companies. Each one of these examples highlights a threat to the company, the company’s profitability, and as a result, the investment in the company. Readers, do you do this type of analysis when considering an individual investment? Is there anything else you consider? I used SWOT to help me pick electives in college. I was a terrible writer when I first started on my degree; 7 english/writing classes later, I’d finally made it to mediocre. I’ts a good thing too. In corporate finance, I’m always writing: emails, reports, analysis. I write all the time. People could really benefit from business strategy tools like SWOT! It serves so many purposes but it can really be helpful when deciding on stocks. 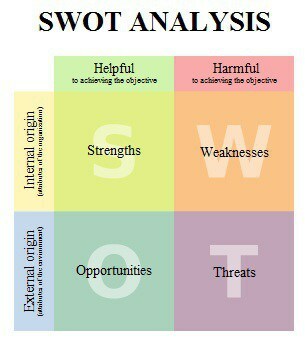 SWOT analysis can be used to make most decisions. It is a great way to come up with the proper choice. Great post! Man… the SWOT Analysis is one tool that does not get enough credit. Sure it’s taught at college/ university, but at my workplace it’s not applied to anything. In my MBA courses, the SWOT Analysis has come up in every single one. How’s that for versatility! 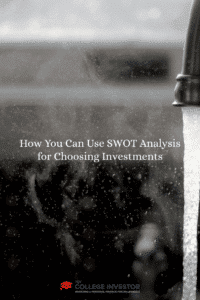 SWOT is a great tool, but not useful for investing, at least not in individual stocks. The company may score 100/100 on SWOT but still be overpriced because everyone can see all the same strengths you see and has already bid up its price. Stock picking is not AT ALL about identifying great businesses which is what SWOT does. It’s about identifying under-priced (or over-priced) businesses. A stagnant but viable business that trades as if it were bankrupt is a far better buy than a booming business that has all its growth already priced in. In any case, even when done right stock picking is a great way to lose money to the market over the long term and enrich your broker and some fund managers in the process. Lowest-cost, maximum-diversification index fund investing is a much better (and more boring) way to build wealth. You’re right in the fact that SWOT doesn’t directly look at price, which is a key factor in investing. I would disagree with you, however, in that picking a stock to invest in is not about identifying a great business – that is all it is about. A great business doesn’t necessarily mean a growing business, which I think you’re mixing the two. Utilities, for example, can be great businesses, and they don’t usually grow too much. What they do offer is great dividends and solid earnings over time. I would also agree with you in index fund investing as a large part of any portfolio, but if you’re going to invest in individual stocks, SWOT is very helpful. Nice article. I’ve been involved with finance for over 25 years and witnessed just about every method for used for buying and selling stocks but not the SWOT. I think most people sub-consciously do a SWOT analysis but tend to focus on one aspect as opposed to combining all four. The next step would be to have a simple scoring method. Cheers and well done. I think it would be interesting to setup a scoring method. It’s beyond my scope, but it would be useful! I don’t think I do this formally but my new rule is that I make sure to know as much as I can about the company and spend a lot of time understanding sentiment and such before making any sort of trade. I think when you piece it together, I probably capture a lot of the details, just not in the way you laid them out. My favorite aspect of the SWOT analysis is that it forces you to slow down so you can make a rationale decision. When you’re investing for longterm, the SWOT is the way to go. Great post Robert! Robert, thank you for spotlighting SWOT and its usefulness. It is underrated as one of several steps in stock analysis. I provide a SWOT analysis for every Individual Stock Analysis on the Dividend Value Builder Blog; along with analysis of Dividend Safety, Profitability & Growth, and Valuation.